While partaking in the gloriousness that was Geek Week on YouTube, I discovered Amy Dallen on the Geek and Sundry channel. She's the quirky girl who is obsessed with comic books, and by golly, if it isn't contagious. So on Amy's suggestion, I've decided to embark on a comic book adventure, see what all of the fuss is about. I read manga and graphic novels, but I tend to grab the ones the teens are interested in at my library. But now I'm going to let the true enthusiasts guide me along my path. What else do you think is a must-read for my list? And if you haven't checked out the Geek and Sundry channel, it's a must. You can watch Will Wheaton challenge celebrities to a variety of board games. You can watch Felicia Day play video games with her brother. 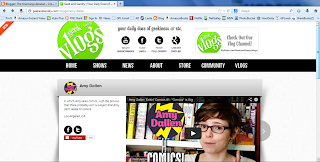 And you can watch Amy Dallen totally geek out and share her love for comic books.